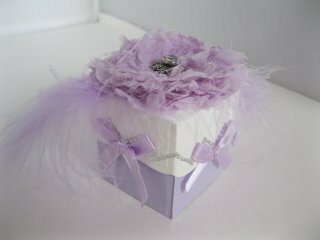 Spellbinders Bracket Edge Box Tutorial will give you some ideas on how to use this practical little box and it is just the right size to add items of jewellery into. It has a multitude of uses and you will have lots of fun dressing it up to suit the recipient and the occasion. Are you looking to give a small gift to someone for their Birthday, Christmas or some other special occasion ? Well this is one way to present it beautifully so that your recipient will be as pleased with the box as they are with the gift itself. This Spellbinder die has been around for a while and can help you with this projects very easily. But it will be more popular as we get closer to Christmas and we realise just how expensive buying suitable boxes can be. You can dress it up anyway you want. These two are for totally different occasion but they look really pretty. 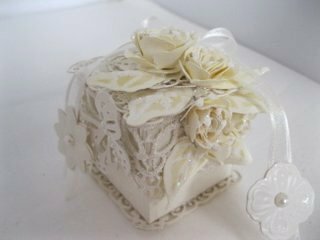 The cream one is for a Wedding Favor Box and will be added to the tables for the wedding breakfast. 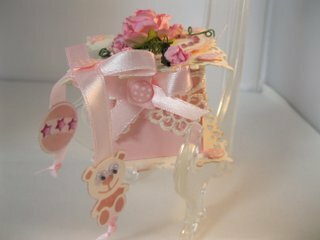 The pink one is a Baby Box and will have a small gift added to the inside for a babys' birthday. Let the tutorial show you how to make the box and give you some ideas of what to place inside it. This box die will fit through most die cutting machines... but you will need to check your manufacturers instructions on how to layer up the plates to both cut and emboss. And check carefully which die you buy as some of the other Spellbinder box dies can only be used with the larger cutting area like the Grand Calibur. This particular set will produce a box that is about 2" but it is big enough to take a jewellery box for that special gift.... just one idea you may like to think about. One of my thoughts was to add it to my table at Christmas with a little gift for each person .... but it won't be chocolates .... coz I will have eaten them! !